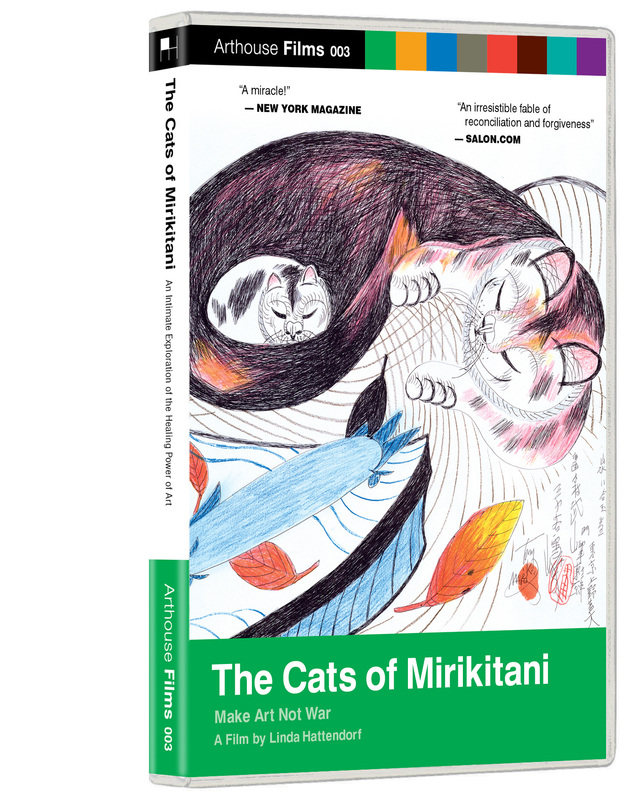 Join us Thursday for a Film Screening of “The Cats of Mirikitani” (2006), with director Linda Hattendorf, free and open to the public. 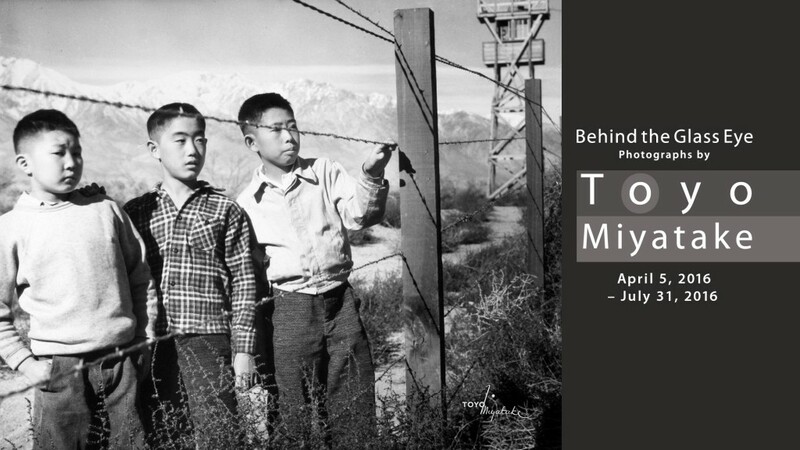 The recipient of numerous awards, including one from the Tribeca Film Festival, this film tells the story of Jimmy Tsutomu Mirikitani, who survived the trauma of World War II and homelessness by creating art. When 9/11 threatens his life on the New York City streets, a local filmmaker brings him to her home, and the two embark on a journey to confront Mirikitani ‘s painful past. 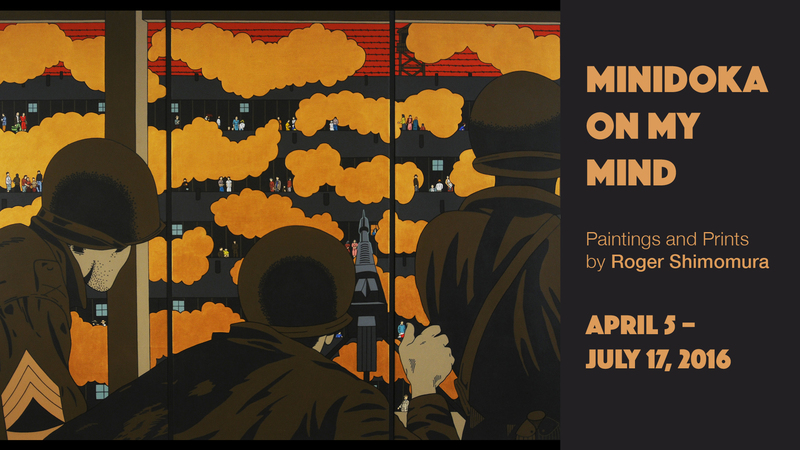 This documentary is an intimate exploration of the lingering wounds of war and the healing powers of friendship and art. Join director Linda Hattendorf and Maki Kaneko, professor of art history at The University of Kansas, for a discussion after the screening. April 21, 2016, 5:30-7 p.m. Optional Photo Shoot, 7-8 p.m. Inspired by the exhibition “Behind the Glass Eye: Photographs by Toyo Miyatake” and taught by choreographer Katie Oliver, NY. Workshop fee $5.00. Advance registration required. 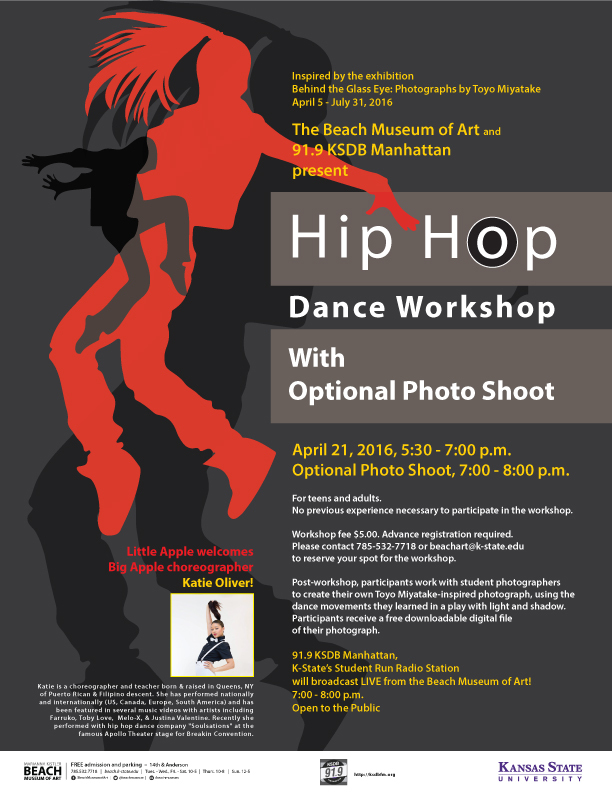 Please contact 785-532-7718 or beachart@ksu.edu to reserve your spot for the workshop. Post-workshop, the participants work with student photographers to create their own Toyo Miyatake-inspired photograph using the dance movements they learned in a play with light and shadow. Participants receive a free downloadable digital file of their photograph. Katie is a choreographer and teacher born & raised in Queens, NY of Puerto Rican & Filipino descent. She has performed nationally and internationally (US, Canada, Europe, South America) and has been featured in several music videos with artists including Farruko, Toby Love, Melo-X, & Justina Valentine. Recently she performed with hip hop dance company “Soulsations” at the famous Apollo Theater stage for Breakin Convention. The workshop is open to teens and adults. No previous experience necessary to participate. 91.9 KSDB Manhattan, K-State’s Student Run Radio Station will broadcast LIVE from the Beach Museum of Art! 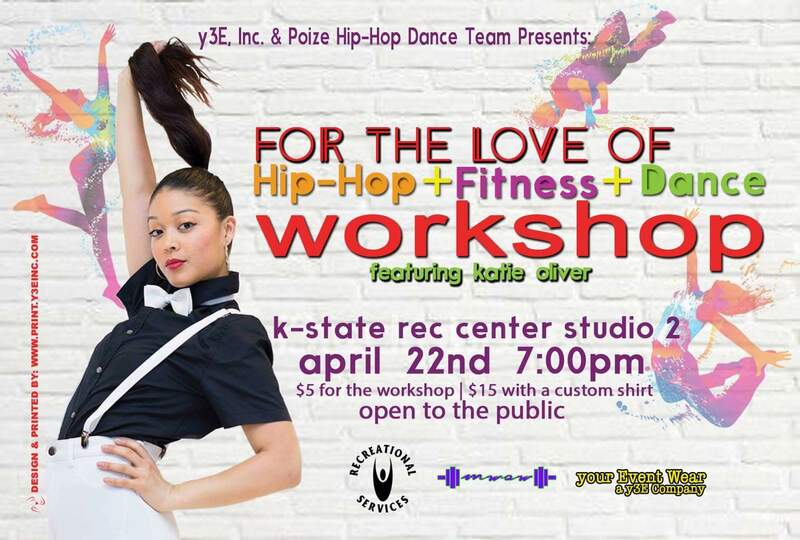 The galleries will be open from 10-8 on Thursday, April 21, and the public is welcome to explore the galleries while hip hop is in the air 5-8 p.m.
Katie will teach an additional Hip Hop workshop 7:00 p.m. on Friday, April 22 at the K-State Rec Center, Studio Two. This highly eclectic saxophone concert will feature Dr. Anna Marie Wytko, Associate Professor of Saxophone at Kansas State University, as well as KSU graduate and undergraduate saxophone students John Ashburn, Adam Lechner, Michael Meier, and Jacob Wright in performances by Japanese, Polish, American, and French composers from the WWII Era. 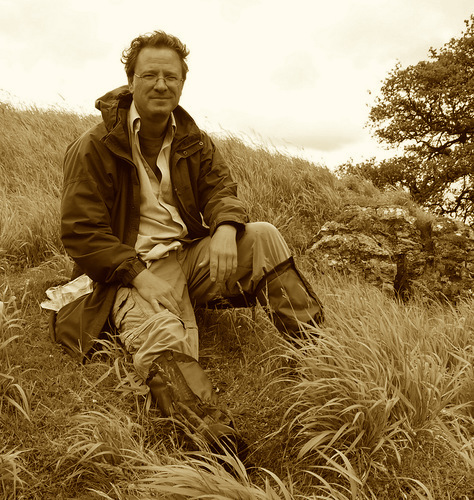 At the conclusion of Saxophone Expressions: An Exploration of Musical Turmoil head up to the Union Little theater for a lecture by K-State Department of English’s Visiting Writer and Speaker, Julian Hoffman.